Precious metals futures scored annual gains ranging from 3.6% for platinum to 55.3% for palladium. 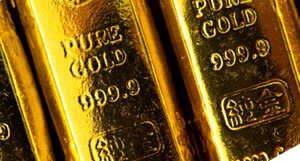 Gold ended the year at a more than three-month high. Gold futures posted their seventh straight session increase on the last trading day of 2017, padding their December and annual gains. In the process, the yellow metal notched its bets close in more than 3 months. Gold for February delivery on Friday advanced $12.10, or 0.9%, to settle at $1,309.30 an ounce on the Comex division of the New York Mercantile Exchange. The close was the strongest since Sept. 25 when prices ended at $1,311.50 an ounce. "Going back to the last Fed meeting with its slightly more dovish tone, commodities markets have gotten a bit of a green light," Reuters quoted David Meger, director of metals trading for High Ridge Futures in Chicago. "This recent bout of weakness in the dollar certainly is fostering a commodities rally and we’ve seen a light downturn in equities as well." Gold futures traded 2.4% higher this week, lifting gains in December to 2.6% and in 2017 to 13.7%. Gold rallied 8.6% last year after registering annual losses of 10.5% in 2015; 1.5% in 2014; and 28.3% in 2013. "Of the 1,527 votes cast in the online survey, 975 respondents — or 64% — called for gold to rise in 2018…"
"Meanwhile, 15 of 23 views from Wall Street — or 65% — called for gold to finish higher in 2018." Ending higher for a fourth consecutive session, silver for March delivery rose 22.2 cents, or 1.3%, to finish at $17.145 an ounce. The settlement was the highest since Nov. 17 when prices ended at $17.373 an ounce. Silver futures jumped 4.3% on the week, registered a December gain of 4.1%, and logged an annual increase of 7.2%. For reference, the white metal leapt 15.8% last year after three consecutive annual declines of 11.5% in 2015; 19.5% in 2014; and 35.9% in 2013. April platinum added $6.80, or 0.7%, to $938.30 an ounce, for a 1.7% weekly increase. Palladium for March delivery shed $2.45, or 0.2%, to $1,061 an ounce, but logged a weekly increase of 3.1%. On Thursday, the metal closed at its highest level since February 2001. The pair was mixed in December with platinum slipping 0.5% and platinum surging 5.7%. In annual results, platinum advanced 3.6% and palladium rallied 55.3%. Gold added $5.50, or 0.4%, to $1,296.50 an ounce. Silver moved up 12.5 cents, or 0.8%, to $16.865 an ounce. Platinum rose $2, or 0.2%, to $927 an ounce. Palladium declined $1, or 0.1%, to $676 an ounce. For the week, they logged advances of 2.2% for gold, 4.3% for silver, 1.6% for platinum and 2.7% for palladium. As for December, their levels were mixed with platinum down 1.4% and the others higher by 1.3% for gold, 1.8% for silver and 4.6% for palladium. London precious metals prices climbed on the year, marking annual gains of 11.9% for gold, 3.9% for silver, 2.2% for platinum and 56.2% for palladium. American Eagle silver coins tacked in at 18,065,500 ounces for their weakest sales year since 2007. For a perspective of the slowdown, Silver Eagle sales reached above 37 million ounces in 2016 and they hit an annual record of 47 million ounces in 2015. The 1oz. silver coins have been produced annually since 1986. American Eagle gold coins totaled 302,500 ounces, which is less than a third of the 985,000 ounces sold in 2016. It also marks their lowest annual tally since 2007. Their sales did surge to 43,000 ounces in December for the strongest month since January when the new 2017-dated editions debut. Also introduced in 1986, the U.S. Mint strikes American Gold Eagles in four formats. Annual sales by size in 2017 totaled 228,500 ounces for the 1 oz. coin; 18,500 ounces for the 1/2 oz. coin; 16,000 ounces for the 1/4 oz. coin; and 39,500 ounces for the 1/10 oz. coin. American Buffalo gold coins posted 2017 sales of 99,500 ounces, their smallest annual total ever. Sales reached 219,500 ounces last year. The 1 oz. series was introduced in 2006. Their second slowest year happened back in 2012 at 132,000 ounces. Their two highest years were in 2013 at 239,000 ounces and their debut year in 2006 at 323,000 ounces. 2017-dated America the Beautiful 5 oz. silver bullion sales totaled 147,400 coins for the lowest amount since 2014-dated issues reached 136,000 coins. Last year’s releases combined for 308,000 coins. American Eagle platinum coins totaled 20,000 ounces for a second year in a row. The series was introduced in 1997 as an annual product for investors but has not always been issued. Most recently, it was absent from the U.S. Mint’s product lineup in 2015. The U.S. Mint has not always produced the coins to meet demand, as was the case this year and last. In their debut year, 2017 American Eagle palladium coins reached 15,000 ounces. The Mint did not strike the 1oz. coins to meet demand as all 15,000 sold on the day they launched. A decade low for Silver Eagles, a lot of people might be ”world coin silver” shopping to save a few cents along with .9999 silver on a few. The Hobby of Kings *+* to, The King of Hobby*s , wish all of you a *happy *new *year, everyone loves to win*+*peace.